Is there a wound that cannot be healed? Why is there such a high percent of adopted kids in recovery? How does an adoptive parent navigate the loss that a child feels but cannot put into words? 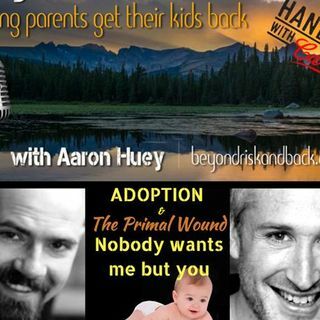 Your host Aaron Huey and Aaron Schneider worked together and alongside children who have experienced what is known as the “Primal Wound” and discuss effective treatment and support for families who adopt. Aaron Schneider is a former massage therapist and is currently a body-centered psychotherapist ... Más informaciones located in Baltimore. Trauma has always been a passion of his and has extensive training in PTSD and trauma therapy. He is currently pursuing a certification in Hakomi Mindfulnes-Centered Somatic Psychotherapy. Ever the spiritual seeker, he was ordained as a minister by Reb Zalman Schachter Shalomi, the founder of the Jewish Renewal movement. In his current practice, he focuses on empowering his clients by helping them realize that emotional pain is not something to cure, but a healthy message from the body asking for powerful change. Aaron has a passion for working with Orthodox Jews who wrestle with their religious identity, families and children with adoption issues, developmental and shock trauma, depression, anxiety and OCD. In his spare time, Aaron loves running, farming, spirituality, healthy eating, and self-empowerment exercises. He is proud to come from three generations of adoption: his aunt, his two sisters and his two children are all adopted. Is it possible to get a hard copy of this podcast?